The solid bodies of the solar system exhibit remarkable diversity in geological behavior, and Francis Nimmo's main interest is in understanding the origins of this diversity. One example is his investigation of Enceladus, a small icy moon of Saturn which is geologically active, with geysers jetting water vapor into space. This hot spot is located exactly at the south pole of Enceladus, and Nimmo has shown that if the hot spot started somewhere else, the satellite is likely to have rolled over until the current polar position was reached. So spacecraft observations can be used to tell us about the internal structure and geological history of this fascinating object. 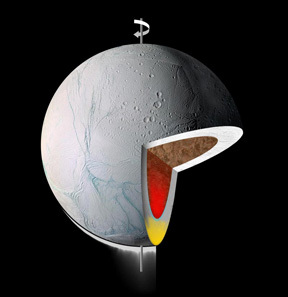 Hypothetical structure of Enceladus, with a warm ice blob (yellow) causing the satellite to reorient. There are many other remaining puzzles. For instance, why is Enceladus geologically active, while its close neighbor Mimas is dormant? Does Enceladus, like Europa, possess a liquid ocean beneath its icy surface? Have other satellites, like the Uranian moon Miranda, also undergone polar reorientation? The ongoing flood of data from the Cassini spacecraft will provide answers to many of these questions. As well as the icy satellites, Nimmo's group also studies geophysical processes on Mars, Mercury, Venus and even the Earth. For more information on these and other studies and to learn about potential opportunities, please see Francis's home page and the Planetary Science research page.